"This music is so delicate, we want it to be in tune. We don't want to come off like a bunch of drunken fat punk rockers." New York's seedy CBGB is one of the truly legendary rock clubs, a place where the building blocks for the American side of the punk revolution were formed so many, many years ago when bands like Talking Heads, The Ramones, Blondie and Television ruled the stage. Owner Hilly Kristal has continued to book a broad range of cutting edge musical acts into his club, and this collection from Music Video Distributors highlights a batch of modern-day macho punk acts, as well as a smattering of diehard holdovers from the glorious old days. There isn't a whole lot of finesse to this production, but hey, this is punk rock we're talking about; with a couple of exceptions, it is essentially the same static camera angle, set at the rear of the room, above the bobbing spike-haired, stage-diving crowd. The acts range from some of the leaders in the loud, screaming brand of skateboard punk, and to make a sentimental old wanker like me happy there are performances by British stalwarts UK Subs and The Vibrators. Of the fifteen bands represented on this collection, each get to do two songs, with the exception of Even Worse (the only band on this disc with a female lead singer—a rarity) and Furious George, who for some reason only get one track. Still, it is an interesting cross-section of artists, with some tongue-in-cheek humor (Adrenaline OD's Old People Talk Loud) balanced against the more serious shriekers (Agnostic Front's Something's Gotta Give). There is also a distinct separation between the harsh posturing of acts like Cro-Mags against the vaguely pop strains of The Vibrators, who dedicate Pure Mania to the late Joey Ramone. I cut my teeth with British punk, so that's where my loyalty lies, and the thug-like persona of most of the American acts seems both comical and remarkably one-note-ish in comparison. The stylistic differences between Brit and US punk is, was, and always shall be miles apart. Image Transfer Review: If you stick a camera at the rear of a crowded rock club, you take what you can get, in terms of quality. The 1.33:1 full-frame transfer on this disc has a lot of grain, and plenty of color bloom, thanks to those damn stage lights. Some performances look far better than others, and the inconsistencies are apparent, but not overtly distracting. The transfer is far from great, but the flaws almost helped me smell the layers of spilled beer and urine on the CBGB floor. That's a good thing. Audio Transfer Review: Punk rock, in its guttural simplicity, was never really structured to take advantage of 5.1 surround, but on this disc the option is substantially more spacious than the 2.0 track that is also included here. The sub doesn't get much of a workout, but the front channels add a sense of fullness that the 2.0 track can't come close to re-creating. Voices are clear, though lyrics are mostly unintelligible, and the music sounds loud and clear. Extras Review: Chalk one up for Music Video Distributors on this one, because included here as an extra is an impromptu Tour CBGB With Hilly (29m:52s). Yep, Hilly Kristal himself, looking bored out of his mind, stares at the floor and narrates a tour of his infamous club. For those who have never been there, but have only heard about CBGB, this is a one-of-a-kind opportunity to see the grubby environs up close, all from the relative safety of your home. Hilly tosses off a few quick anecdotes of punk lore, pointing out where Sid Vicious and Cheetah Chrome got into a fight, and he mumbles platitudes about bands like The Revlons and The Raybeats that made my heart nearly burst with nostalgic pride. The disc is cut into 28 chapters (one per song). This is a pretty impressive cross-section of performers, all full of punk's kinetic fire and brimstone, in varying degrees. 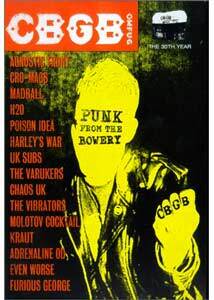 There are times when the angry, loud, aggressiveness of three-chord rock-and-roll is the only way to go, and CBGB: Punk From The Bowery is a budget-priced primer. Yeah, I'm too old to stage dive, but hearing the UK Subs again makes long for the old days.